This peach rosemary lemonade is made with roasted peaches for a slightly sweet and tart drink that’s perfectly refreshing on a hot summer day. If there was any doubt that this month’s seasonal eating challenge with Silk wouldn’t include peaches, well, then clearly it’s like we don’t even know each other. Peaches are my jam. Both literally and figuratively. I seriously wait all year for July. While they’re out in June in New York, the possibility of getting a bad one (nothing is worse than a mealy peach) is way higher than it seems to be in July. This week alone I’ve been to the farm stand 3 times and purchased at least 5 pounds of them. The peach situation is tricky in our house, Ulysses likes all his fruit hard, as in not ripe. I can’t even get into it because I’ll go off for at least 1,000 words on how much this irritates me. So I have to buy enough that he can have his disgusting unripe fruit while there are still plenty left for me to eat when they become perfectly soft and juicy in a few days. Hence, the 5 pounds of peaches. Since I’ve already told you all there is to know about my favorite fruit last summer in this guide to peaches and there are plenty of peach recipes spanning all sorts of food categories like this pistachio crusted flank steak with peach puree, this paleo maple peach bread, these grilled peaches with brown sugar pecan crumble, this peach burrata bacon quesadilla or any of the 30 other peach recipes in the archives of this site, I thought a nice refreshing, somewhat sweet, somewhat tart roasted peach lemonade would be the perfect thing to celebrate all July has to offer when it comes to the beloved peach. While I have fond memories of sickenly sweet pink Countrytime lemonade as a kid, I really hate sweet lemonades as an adult. As much as I love Chick-fil-A, their lemonade that everyone raves about leaves this sugar nastiness that coats my entire mouth and ruins the whole thing for me. Roasting these peaches with a drizzle of agave (or honey) brings out their sweetness and takes away any need for additional sugar in the drink. I really hate drinking calories as it is so added sugar in lemonade has no place in my house. 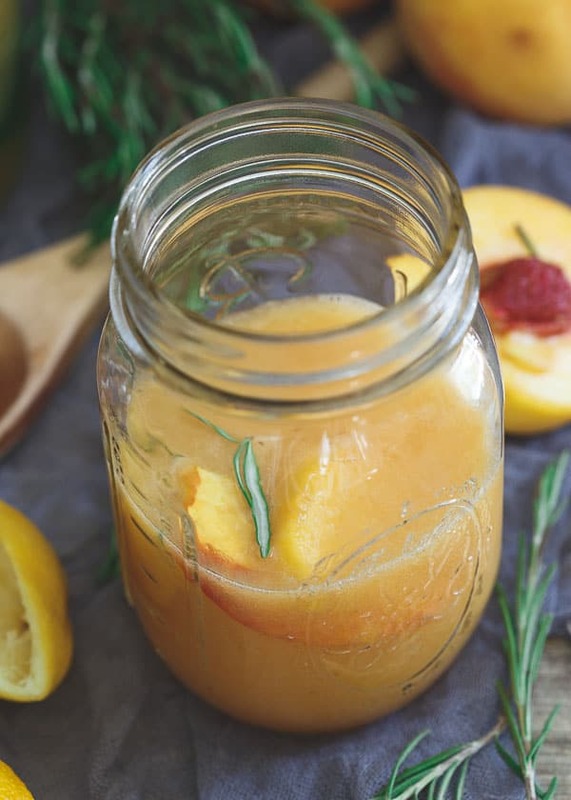 The peaches are roasted with rosemary and then blended with fresh lemon juice and water to round out this easy drink. With some ice cubes and a mason jar, you have the epitome of summer in NY right in your hand. 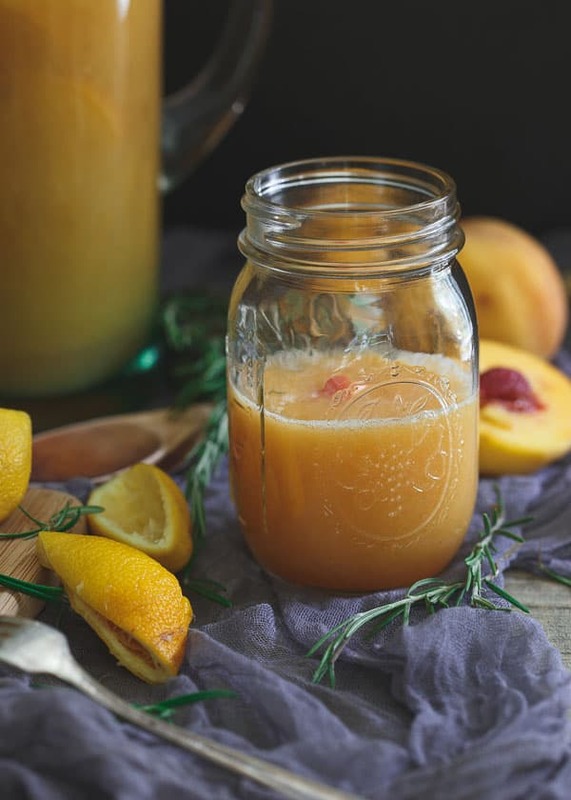 This peach rosemary lemonade is made with roasted peaches for a slightly sweet and tart drink that's perfectly refreshing on a hot summer day. 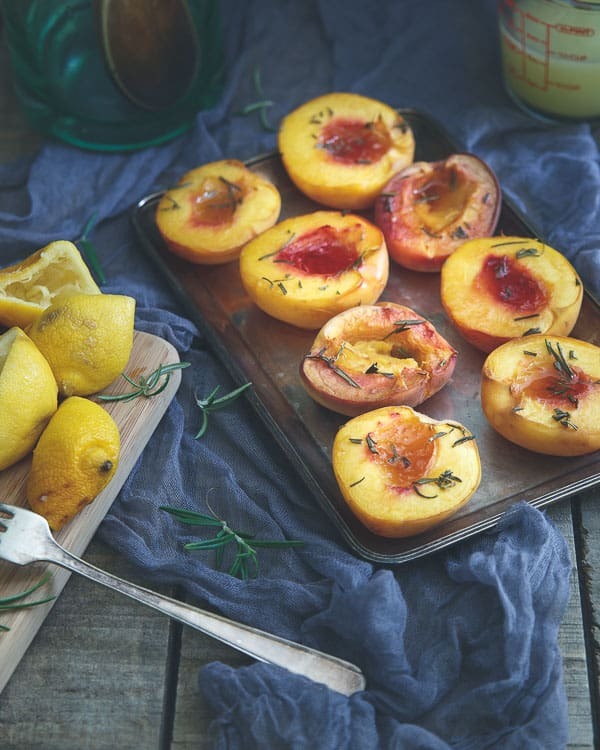 Place peach halves in a glass baking dish, drizzle with the agave/honey and sprinkle the rosemary on top. Cover with tin foil and roast for 35 minutes. Remove peaches from oven and let cool to touch. Remove skin from peaches, it should come off easily after roasting and place the peaches with any accumulated juices from the baking dish in a blender. Blend until smooth. Add the lemon juice and water and blend again until fully incorporated. Pour the lemonade into a pitcher and refrigerate until chilled. Serve with additional sliced peaches and rosemary sprigs. Thanks to Silk (<– sign up for their newsletter to get an instant coupon for any Silk product and be eligible for monthly giveaways) for letting me share this seasonal eating journey with you! Wow, so so so fresh! That must be soooo flavorful! I love that you roasted the peaches for this glorious beverage! Such a good call, major flavor booster. Making asap. I always love your recipes. LOL, when you talk about the ripe vs not ripe fruit. My husband and I are the same about bananas. He likes them green and I can’t stand them that way so it’s always a challenge! I love your pictures, this looks so refreshing! I’m with ya on the not so sweet drinks, I just can’t handle it. This peach lemonade looks amazing Gina, roasted peaches??? Genius. I may or may not want to add champagne to this, and make a bomb diggity bellini. YUM! Roasting the peaches would give this a very unique flavor. LOVE it. Unripe??? Noooo! Peaches are my jam too (ripe ones :). My parents have a tree, but I was out of town during the entire harvest this year. SO bummed! It’s not even worth it buying at the grocery store. I need to get my booty over to the farmers market. This lemonade looks incredible!! Sounds perfect, I’m all about peaches this time of year too! This peach version though? It’s gorgeous and I could sip all day long! Pinned! 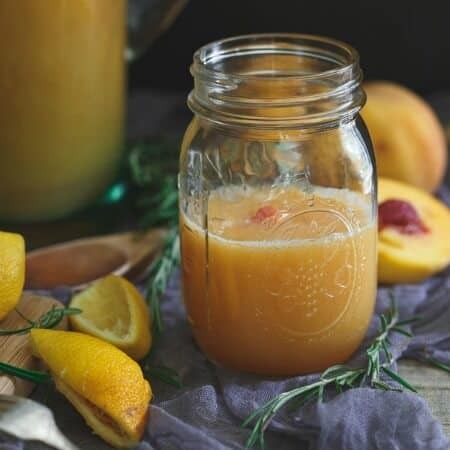 Wow, love this beverage idea.Fresh peach tea is one of my favorite drinks, can’t wait to try this roasted lemonade version. And I LOVE that you put rosemary in it! I used nectarines instead, only because my grocery store didn’t have peaches available. I was worried it wouldn’t taste right but it came out great! Good alternative but now I want to find peaches so I can really compare the flavors! Also I hand squeezed my lemons and it was kind of a pain…will definitely be buying a lemon juicer!